After living in the Sunshine State for much of the past 18 years, Vanessa Blakeslee can now be called a Floridian. Originally from Pennsylvania, Blakeslee now resides and writes in Maitland. Her writing transcends the touristy and gimmicky delusions of Florida and instead casts a unique lens on the Floridian culture and people. Many of her stories from her debut short story collection, Train Shots, published by Burrows Press in March 2014, feature Florida and its resilient and sometimes estranged residents. The collection won the IPPY Gold Medal for Short Story Collections. Blakeslee has also won the inaugural Bosque Fiction Prize and has been awarded numerous grants, residences, and fellowships. Blakeslee’s work has appeared in prominent journals such as The Southern Review, The Paris Review Daily, Kenyon Review Online, and many more. Saw Palm featured two of her poems, “The Horse” and “Pantoum for Bruce Grossman,” in Volume 6. Recently, I had the opportunity to ask Blakeslee about Florida, writing, and success. Photograph courtesy of Vanessa Blakeslee. Rob Alexander: So how did you end up in Florida? What pulled you here? What makes you stay? You have to miss snow a little bit, right? Vanessa Blakeslee: Growing up in Pennsylvania, I loathed the long winters and decided to apply to colleges in the South—not only to escape the freezing cold and lack of sunlight, but also to experience a drastically different region. Rollins College happened to offer the best scholarship package, so that’s how I ended up in Winter Park. Not only can I hardly believe that I’ve stayed this long—eighteen years—but that various ventures in my twenties didn’t pluck me up and away. I applied twice to MFA programs and wasn’t accepted, applied to teach in Japan and oddly, nothing came of that. After the MFA, I applied to Ph.D. programs—that was 2009, the economy was a disaster and I got rejected everywhere, to the shock of my faculty mentors at Vermont College. The rejection letters all stated how the programs had been flooded with more applicants than ever; I might have applied again the next year but decided to write a novel instead. I’d thrown my hook into the sky and sensed that after two Master’s degrees, a Ph.D. might not be my path, after all. The most wonderful aspect of staying in central Florida this long is to see how much the literary scene has blossomed over the years. We have our longstanding traditions, like the annual Winter with the Writers festival at Rollins College, which brings in A-list poets and writers every February. Over the past five years, however, I’ve noticed a renewed energy and enthusiasm within the writing community. UCF now offers the MFA in Writing, plus a low-residency MFA is underway at the University of Tampa. The Jack Kerouac Writers-in-Residence Project hosts a new writer every three months; those residents come from every corner of the globe and bring new lifeblood. Burrow Press, the publisher of Train Shots, showcases noteworthy talent several times a year at its up-and-coming reading series, Functionally Literate. Peruse the weekly event listings during the school year and you’ll discover the calendar packed with literary events—so many, you’ll often find yourself missing out. I love where the Orlando lit scene is at right now. It’s just big enough that we’ve got a considerable pool of varied and burgeoning talent, yet small and intimate enough that most of us know each other and love nothing more than cheering one other on, absent of petty jealousies and competition. I’m not claiming that we’re the Brooklyn of the South yet—maybe in another eight or ten years. But we’re definitely on our way. I couldn’t be happier to live here right now, because I deeply sense that we—not just as a literary scene, but as a city—are fast approaching coming into our own. And ultimately the lit scene will change as it grows bigger; the egos will flare up as the intimacy dies. But I hope that doesn’t happen for a long time yet. I can only describe our literary scene as being a place of true community, love and support. I’m ever grateful for it, and excited for its future. And yet, I also sense that after eighteen years, I’m open to moving on. You’d mentioned missing the snow—I won’t go so far as to say I miss it, but a funny thing happens after you acclimate to a certain region over the years. What was once familiar becomes exotic, the exotic familiar. The past two autumns I’ve been fortunate to spend in the Hudson Valley and my hometown in Pennsylvania, and the foliage is just stunning. I’d forgotten that. And in 2013, I spent five weeks at the Banff Centre in Alberta, where the snow was still falling in May. The wildlife grows so big there, it’s as if everything is supersized! So as much as my heart belongs to Florida, I’m more open to relocating in the next year or so than ever before in my adulthood. RA: I love this idea about the exotic becoming familiar, the familiar becoming exotic. Is travel important? To constantly submerge yourself with the exotic? Familiar is different than ordinary, but could that become danger? To become too familiar with a topic or place and to lose the exotic? VB: From the first time I studied abroad at nineteen, travel has played an integral role in finding my center and realizing my full self. I don’t know that I’d advocate a “constant” submergence with the exotic as I believe having a home base provides a lot of stability and shouldn’t be overlooked. For me, the ideal life contains intermittent, prolonged forays into the exotic – a month or two in unfamiliar terrain. The stimulation of new surroundings opens up the senses, and writing is so rooted in the sensory that I don’t think you can ignore the importance of that. But at the same time, travel away from home turf gives us a different perspective on that place. Again, “danger” might be too harsh a word in regards to familiar, but we can get in comfortable ruts and resist growth when we’ve tread the familiar for too long without time away. As artists we’re in the business of shaking up our audiences, so it makes sense that we recognize the need to shake up our own lives, too. The exotic keeps us curious and motivated, even our curiosity revolves more around a fantasy of a foreign locale. So I think it’s vitally important. Think of all the Greek plays, and how many adventure stories took place in distant lands. Those playwrights knew how much audiences love stories that happen far away, and are perhaps more likely to pay attention to the morals and lessons of battles staged far-off rather than in their own backyard. I travel to colonies and residencies for all of these reasons. What better way to visit different pockets of the world and push forward with your work, besides? Through residencies I’ve visited so many places I was never even aware of, and likely wouldn’t have had a reason to go: this year, Montauk, NY, thanks to the Edward F. Albee Foundation, and before that, Banff, Alberta through the Writing Studio program there. I have a rule that I don’t go back to the same residency twice—life’s too short—and there are so many amazing residencies the world over. It will take a lifetime to visit them all. RA: In one of your stories from Train Shots, "Don't Forget the Beignets," Sarasota is seen as an escape, or salvation for the protagonist Merly. While in your story "The Lung," there are "wildfires...burning across the state," covering Central Florida in smoke. Is this Florida? Fiery brimstone but also sanctuary? VB: Oh yes. It certainly has been for me, on a personal level—the place where I’ve been forced to face my demons, yet where I return to recharge, either alone or within the community. But I think you could argue that this paradox sums up Florida as a whole. Look at the elections. We’re a battleground state, as well as a border state. We’re the gateway to Latin America and the Caribbean. The population influx is happening so rapidly, wild contradictions spring up wherever you look. Literature and art thrive on the juxtaposition of opposites. Despite the subtropical haze luring you into a slower pace—to kick back at an outdoor bar with friends, to read for long hours on the porch—such contradictions have certainly fed my work. RA: Florida appears throughout Train Shots, but instead of stories about beaches, or hurricanes, or amusement parks, you give us stories filled with culture and people and relationships, yet I still felt Florida in “The Lung,” “Uninvited Guests,” and even Orlando is mentioned in a flashback in “Princess of Pop”. How do you balance going beyond the surface of a place while still capturing its essence? VB: I suppose I trust the telling detail that is unusual and unique, and particular to my eye taking in the world around me. Starting any fiction, I know I’m going to delve beyond the surface. But there comes a point in drafting where you sit back and take in what’s emerged in the early pages. You can make decisions to take a story in one direction or another. As a transplant Floridian who travels widely, I’m pretty familiar with outsiders’ perceptions of what our state is and isn’t. I take pleasure in quickly correcting misconstrued stances, and I supposed that’s what I’m doing here—all in good humor, of course. Many people don’t realize that Deland is a skydiving mecca, so I had fun working that into “Uninvited Guests,” to round out the young male characters who readers might otherwise see as crackers. Most people think of hurricanes when they think of Florida, when in reality I’ve only lived through one catastrophic hurricane season in eighteen years. Yet plenty of other natural disasters abound—the most lightning strikes in the world, red tides, wildfires. “The Lung” provided ample opportunity to play with one of these elements, set the story against a more unexpected and common ecological occurrence. 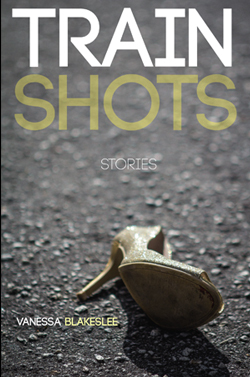 Vanessa Blakeslee's debut short story collection, Train Shots, is available from Burrow Press. RA: I recently saw the TrIP (Transit Interpretation Project) video featuring you traversing Orlando, the Lynx Bus and Universal Studios. Here we have film, music, writing, all working to create this beautiful portrait. What was it like to complete this project, to work with a filmmaker and showcase Orlando? VB: The TrIP Project took place last November, and it really was great fun to explore Orlando along with a filmmaker. We rode the Lynx Route 40 bus from the downtown terminal all the way to Universal CityWalk, then on the way back stopped at the Mall at Millennia and the Winnie Palmer Hospital. Afterward I wrote three poems, none of which would have been conceived if not for the immersion assignment. Although the experience merely spanned a 12-hour day, it forever changed my view of Orlando—the realization that the Orlando I navigate by car and know intimately is drastically different than the city as experienced by those who traverse it by bus. In reality there are multiple layers of Orlando, and what was remarkable that day was how we inhabited and then crossed different socioeconomic realities. In the morning commute we rode with blue collar workers, some getting off night shifts and others in fast-food uniforms, heading into work. We arrived at CityWalk at 8am, in time to face the sea of tourists flooding the gates as the park opened—people for whom Orlando remains pure fantasy, constructed entertainment. From there we went to the Mall at Millennia; before we even crossed the parking lot we found ourselves awash in shiny luxury—SUVs and designer-bag toting shoppers, and inside, another fantasyland of pristine, material comforts. Ultimately, the TrIP project enhanced my vision of Orlando as a dystopia brimming with haves and have-nots, one that’s not taking place in some far off-future, but is very much the here and now. I’m itching to write a dystopic novel set in central Florida; the difference will be those class divides will become even more pronounced in the decades to come. I highly recommend creatives in other cities to take on this project, of traveling and documenting their city by public transit. You won’t regret it. As for the arts community in central Florida, I believe it is growing more integrated—due in part to projects like this one. There’s an immense sense of adventure when you set out on a collaboration, akin to a road trip or, maybe, I’m guessing, getting pregnant—you’re excited for the possibilities, and you have no idea what lies in store. You’re anxious, doubtful. There’s also a measure of relief, that it’s not all up to you and you’re in this with someone, together. That relief precedes the satisfaction that arises when your collective efforts come together and create a work that, as you put it, is layered and idiosyncratic, thought-provoking and hopefully sustaining. Since then I’ve had the opportunity to crew on a short independent film and act in a silent role—a rewarding experience. But ultimately, tromping around wires and hoisting sound booms for hours isn’t for me. RA: I know you write poems, short stories, novels, blogs, essays, do you ever branch out from the written realm into other forms of artistic expression? I may have heard something about belly dancing – is this true? Is there a link between writing and these other forms of art? Is it all drawn from the same pool? VB: For five years I danced with Orlando Bellydance and performed as a cast member of the troupe Gypsy Sa’har. I also wrote about the relationship between dance and writing in a monthly craft blog which ran at the Burrow Press Review, the influence of the different art forms upon one another. The short answer is that, in my experience, practicing some sort of regular movement and breathing exercise kicks your cognitive function up a notch and is paramount to turning out your best writing. Plus the workout counters all the sitting and crouching that accompany the writing process. I wouldn’t say that the impetus for dance comes from the same place, however—choreography belongs to the wordless realm, more akin to visual art in that sense. But inventing your own choreography, working through a song in sections, is a lot like drafting a poem or a narrative. A dancer is also a storyteller. The book launch of Train Shots prompted me to take a hiatus from dance, but I miss those hours in the studio and intend to return soon. Although I won’t be returning to the troupe or to perform. I simply don’t have time for that, and in a way, that keeps the pressure off—that when I take up dance again, it’ll be strictly for the mental and physical benefits, plus to see the friends I’ve made over the years. This question is well-timed, incidentally, as I’ve just begun to assemble an essay collection for Burrow Press that should contain “The Shimmying Writer” blog column, twenty-two essays in all, as well as other nonfiction pieces on the writing life. No publication date yet, but I’m guessing that readers can look out for the book in late 2015 or 2016. I’m rather excited, as nonfiction just happened upon me, kind of the way dance did. In fact, I only discovered dance because a student of mine in an advanced essay writing class I was teaching wrote a stellar piece on her first lesson. So the blog column grew out of that, and then I placed a few essays at The Paris Review, Tin House, and other places here and there. Now I have enough essays for a book, imagine! RA: Congratulations on the collection of essays, and to have pieces originating from your blog column “The Shimmying Writer.” Has blogging made you view writing differently? Did you ever write non-fiction before you blogged? Can you give us any hints or themes we might see from this future collection? VB: Thank you. What’s most magical to me about blogging is that you can write a piece in an afternoon, and with the click of a mouse, instantly publish it to the world. I started blogging after submitting my work to journals for several years straight, and literary writers know what an agonizing wait that is, until you hear back. But no, I hardly wrote nonfiction before I blogged and doing so opened up that whole genre for me and I discovered I quite like the process in which a personal essay unfolds, how you very often pose a question in the beginning and work your way toward answering it. In a way, it’s a hell of a lot easier than writing fiction but that only makes me miss the challenge of creating characters and worlds more. And I do get tired of the “I” voice that builds over the course of reading a series of memoirs and personal essays. As we assemble the collection, we’re looking for ways to break that up. So the challenge with the personal essay is how to open the subject outward more. “The Shimmying Writer” essays trace my journey into Middle Eastern dance, from simply taking lessons at first to mastering props, then deciding to audition for the professional dance troupe. At the same time, I was writing and revising my first novel, struggling through so much doubt and “dark nights of the soul” as an artist. So the column has an arc to it, as I eventually earn a spot in the troupe and land a literary agent. The final essay, “Two Masters,” discusses how I had to ultimately choose to step away from dance as my literary career took off. I do think that having a physical practice is essential to creating our best work, and that not enough attention is paid to the importance of this relationship to our cognitive abilities. Writing a novel is like preparing to have a baby. I wouldn’t dream of starting either without being fit, physically and mentally. So I’m not sure that’s an overt theme of “The Shimmying Writer,” but I can certainly argue for it in retrospect! My novel will be released from Curbside Splendor in September, 2015. RA: I’ve read elsewhere that “Train Shots” and “Clock In” have details from your experience working in a local bar. You also mention how real life anecdotes can inspire you to explore unusual circumstances. Your stories often ring true and gritty. Do you think these non-fictional elements increase those attributes? VB: They do, but this usually happens on a much more subconscious or subtle level. While working at PR’s, the Tex-Mex joint, I never fathomed I’d one day write a story about a train engineer who struggles with suicides on his track, or set a scene in that bar. When I’m writing fiction, I’m pulling from a lifetime cache of images—whatever the conflict warrants. And then as I meander through my days, I’ll have curiosities or fixations on objects or places that I have a yearning to play with in fiction. For instance, I have a mechanical bird in my bedroom, a gag gift from my dad last Christmas. The bird has this motion detector inside, and whenever I’m making the bed or getting dressed, it chirps incessantly. At first I thought it would be annoying, but the funny thing is, I catch myself affectionately chiding the bird as if it’s real. So have other houseguests. Which makes me wonder to what extent mechanical pets may be in our future. I just have a sense that this silly object might work its way onto the page somehow, somewhere. That’s how real life informs my fiction. RA: Let’s talk about process. How do you develop a story? Let’s say, “The Sponge Diver,” for example, where a birth control sponge gets, um, stuck. Do you start with an idea or image, or do you begin with a character or possibly even a setting? VB: For the most part, my fiction arises very much from setting. I’m not so much an image-driven writer; often I find myself fascinated by hearing anecdotes of people stuck in unusual circumstances, and my stories arise out of exploring those predicaments. “The Sponge Diver” and “Ask Jesus” are glaring exceptions. In both cases, curious physical objects prompted an imaginary narrative—who might own or purchase this object, and why? What type of conflict might arise surrounding this peculiar item? Might it be funny, or tragic? Both? Contrast those dramatic questions with what drives stories such as, “Welcome, Lost Dogs” or “Don’t Forget the Beignets.” In “Princess of Pop” setting looms so large, it functions almost as another character: the pop star is falling apart, she chooses to hole up in the hotel where Joplin died, and the story pretty much remains there. In others, where the setting takes more of a backseat to the conflict—“Ask Jesus” comes to mind, as well as “The Lung” and even “Hospice of the Au Pair”—I crafted the setting to create a certain desired effect. For instance, “The Lung” could have taken place anywhere. But since it’s a story about smoking, disease and the impermanence of nature, I set it in Florida during a summer of raging wildfires. Likewise, I chose for the protagonist to work in the field of environmental protection and have a green thumb. Conversely, “Hospice of the Au Pair” was originally set in Florida, about a WASPy middle-class girl who falls in love with a morphine-addicted doctor, but something about the premise and setting rang as too expected, somehow. Maybe it came off too consciously as “another kooky Florida story.” In that case, changing the backdrop to Costa Rica injected the story—if you don’t mind the pun—with just the unusual details to make it truly fresh and somehow more believable in its peculiarity. Juventud, my debut novel that revolves around Cali, Colombia, could only take place there, however. The political backdrop and historical events preclude the conflict from occurring in another place and time. That book will be released in early September, 2015, from another notable indie press, Curbside Splendor. I’m really excited to be working with them. So my calendar is filling fast over the next two years, but for all the best reasons. RA: Also, congratulations on Juventud! John Dufresne wrote that you were “somebody’s big secret until now.” He was right. How has all this success changed your life besides your calendar? What advice do you have for young writers out there who want to succeed in the modern era? VB: That was very kind of John. My advice to writers just starting out is to cherish your obscurity and make the most of this time. Produce as much creative work as you can, and save the blogging and tweeting for later. I’ve loved publishing with a small press, but that’s meant I’ve orchestrated nearly all the promo work myself—lining up reviews, interviews, book events, and I even have the part-time assistance of my fabulous aunt, who retired last year from a 30-year stint in publishing just before the release of Train Shots. Sadly, I’ve hardly written any new fiction as a result. This may sound precious and I don’t want it to by any means, but for me to really focus and dive deep into imaginative territory, I can’t be living so much on the surface of life, which is the Internet’s domain. So I’m hoping to land more residencies in 2015 where I can regain that focus and return to projects for a few weeks here and there, uninterrupted—before the promo for Juventud kicks into high gear. You sell books at readings and speaking events, so you’ve got to say yes to those, and each one has got to be promoted. A social media presence is essential, as is guest blogging and having essays published at highly-trafficked sites. Look at Roxane Gay’s success—I firmly believe she’s the model for the future. If you can persuade an intern, friend, spouse, or relative to help you with the publicity, by all means, do it. In just a short time, my life has changed tremendously. That’s not to say I don’t enjoy the events; I’ve always enjoyed reading to others. If anything, all the publicity makes me realize what I most love to do is to write fiction. The act itself trumps the end product. Vanessa Blakeslee's debut short story collection, Train Shots, was released in March, 2014 by Burrow Press and is the winner of the 2014 IPPY Gold Medal in Short Fiction. The book was also long-listed for the 2014 Frank O'Connor International Short Story Award. Vanessa's writing has appeared in The Southern Review, Green Mountains Review, The Paris Review Daily,The Globe and Mail, and Kenyon Review Online, among many others. Finalist for the 2014 Sherwood Anderson Foundation Fiction Award, she has also been awarded grants and residencies from Yaddo, the Virginia Center for the Creative Arts, The Banff Centre, Ledig House, the Ragdale Foundation, and in 2013 received the Individual Artist Fellowship in Literature from the Florida Division of Cultural Affairs. Vanessa earned her MFA in Writing from Vermont College of Fine Arts. Born and raised in northeastern Pennsylvania, she is a longtime resident of Maitland, Florida. Blakeslee's debut novel is scheduled for release by Curbside Splendor Publishing in Fall, 2015. Photograph courtesy of Vanessa Blakeslee. Rob Alexander is a former swimmer and swim coach from Columbus, Ohio. He currently teaches Composition and Creative Writing at the University of South Florida and also is a fiction and poetry editor at Saw Palm: florida literature and art. His work has appeared in Columbus: Past Present and Future, Perceptions Magazine of the Arts, Pithead Chapel, White Stag, and was recently nominated for the 2015 AWP Intro Journals award for Fiction. Photo credit: Melissa Pauquette.